Operating in Yeomans’ tradition in Australia today are Kirsten Bradley and Nick Ritar, who with their young son Ashar live up in Mudgee. A while ago, Kirsten and Nick did define themselves as artworld-artists, and they popped up quite often with high-profile video installations, projection performances and gallery shows. But for about five years now, they have eased away from all that stuff, and gone into… farming. And since Nick and Kirsten aren’t particularly active in promoting themselves as artists right now, the artworld has, to a large extent, stopped paying attention to them. Not that this matters a great deal to their project of cultural change. As Milkwood Permaculture, they have been using all the skills acquired over their years working in the artworld (and many more acquired since) to make an even bigger impact. By setting up their own farm as a “case study research project”, and running dozens of educational courses for their peers, Milkwood is exploring how we might live our lives differently. How does this relate to Yeomans? 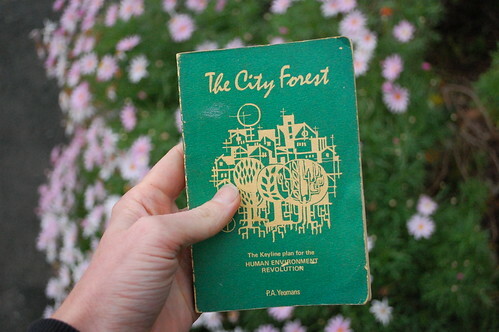 I’ve been reading Yeomans’ little green book from 1971, The City Forest: The Keyline Plan for the Human Environment Revolution. 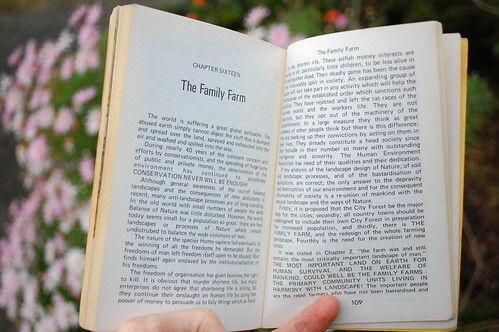 For the first half of the book, Yeomans discusses the fundamentals of his Keyline design ideas… But towards the end, he includes a passionately written chapter called, rather innocuously, “The Family Farm”. In this chapter he talks about the return to small-scale (but commercially productive) organic farming as a ‘rebel’ activity in the face of large-scale chemical agriculture. Milkwood is not just altering the use of their bit of land. They are doing that (as Yeomans himself did, using his own family farm in Western Sydney for a major case-study). But just as Yeomans did, the Milkwood family farm is simultaneously wrangling all the arts of contemporary communication media they can, to gently nudge at the culture beyond the boundaries of their own farm gate. * It’s possible that this attempt to redefine art is a bit futile. Coming, as Ian and I do, from the artworld, any redefinition we make is merely an expansion of the artworld definition to incorporate activities which hitherto were outside the artworld. Hence it’s not really a redefinition but a loosening of the boundaries. But I think the thing we’ve been getting at, in our recent discussions with each other about this stuff, is something like a return to the understanding of art which you get in phrases like “the art of cooking” or “the art of motorcycle maintenance”. Art in this sense means an activity done skillfully and in a way which, to some extent, shifts the goalposts. In Yeomans’ case, you could talk about “the art of agricultural innovation”. What cannot be left out when thinking about these arts, I would say, is their aesthetics, meaning the way that they are carried out: their material economies, their social ethics, their physical forms. This entry was posted in Farming, Permaculture, Yeomans. Bookmark the permalink. Post a comment or leave a trackback: Trackback URL. I don’t think it matters whether or not cultural innovators care about being categorised as artists. The conventional art world is so precious about this sort of thing yet they barely notice that nearly everybody else regards their imagined special status as a bit of a joke. However I would like to see the term artist take on an even more special status but only if it’s earned ie if you don’t really innovate, if you don’t really change the culture even in a small way, then you don’t get the title artist. It should become as laughable to describe yourself as an artist as it would be to describe yourself as a genius. In that way Lucas is right about common parlance, The way that it is commonly said that “so and so is a real artist” when talking about anything from hairdressing to motor repair is a way of acknowledging a particularly impressive combination of skill and creativity and that is part of what I’m talking about. But I’m also suggesting it should extend much further, that the institutions should be searching for and exhibiting and debating the merits of the life work of people like Yeomans rather than the vacuous pompiers of the biennale industry.